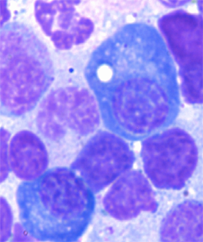 Long-lived plasma cells have a distinctive "fried egg" appearance, containing bubble-like vacuoles or lipid droplets, which are generally rare in bone marrow cell samples. Emory immunologists have found that these cells represent an archive of the immune system's responses to childhood infections. Image from Halliley et al, Immunity 2015 (supplemental figure 2). Immunologists from Emory University have identified a distinct set of long-lived antibody-producing cells in the human bone marrow that function as an immune archive. The cells keep a catalog of how an adult's immune system responded to infections decades ago in childhood encounters with measles or mumps viruses. The results, published Tuesday, July 14 in Immunity, could provide vaccine designers with a goalpost when aiming for long-lasting antibody production. "If you're developing a vaccine, you want to fill up this compartment with cells that respond to your target antigen," says co-senior author F. Eun-Hyung Lee, MD, assistant professor of medicine at Emory University School of Medicine and director of Emory Healthcare's Asthma, Allergy and Immunology program. Co-senior author of the Immunity paper is Iñaki Sanz, MD, professor of medicine and pediatrics, chief of the Division of Rheumatology, Mason I. Lowance Chair of Allergy and Immunology and a Georgia Research Alliance Eminent Scholar. The research was started when Lee, Sanz and colleagues were investigators at the University of Rochester Medical Center, and continued when they arrived at Emory in 2012. The first author of the paper is Jessica Halliley, MS from Rochester. As described in part of the Immunity paper, the researchers studied 11 older individuals (aged 43 to 70) who had not been immunized against measles or mumps, but who had antibodies in their blood indicating infection by those viruses in childhood. Measles and mumps vaccines first became available in the 1960s. Antibodies in the blood have a half-life of just a few weeks, so researchers thought these individuals had long-lived plasma cells, or white blood cells secreting antibodies, dating from the childhood infection. Examining bone marrow samples obtained from these volunteers, researchers divided plasma cells into four different groups based on the proteins found on their surfaces. Only one group ("subset D", CD19-, CD38high, CD138+) contained the cells that produce antibodies that react with measles or mumps virus. "I like to call this group of cells the 'historical record' of infection or vaccination," Lee says. In contrast, cells producing anti-influenza antibodies were found spread across three of the subsets. Because study participants were likely to have been exposed to influenza by annual vaccination or infection more recently than measles or mumps, the researchers inferred that cells specific to recent exposures can reside in multiple subsets while subset D represents the long-lived plasma cells. In separate experiments, volunteers who were vaccinated against tetanus did have some plasma cells producing anti-tetanus antibodies within three weeks in several subsets, but over time tetanus-specific plasma cells were found in subset D.
The team proved that subset D cells were exclusively responsible for producing the measles- and mumps-specific antibodies in the blood of one of the older volunteers, through proteomics and RNA sequencing techniques. Compared with other subsets, subset D cells are more quiescent: they displayed less signs of proliferation. In addition, subset D cells have a distinct "fried egg" appearance, containing bubble-like vacuoles or lipid droplets, which are rare in bone marrow cell samples, and a tighter, more condensed nucleus than other white blood cells. Plasma cells differ from many other cells in the body in that they undergo changes in their DNA -- specifically, their antibody genes. In the patients the researchers examined, antibody genes from subset D are much more diverse than those from other plasma cells. Lee says this finding also reflects subset D's role as an archive, which does not devote too much cellular space to any one vaccination or infection. A study, recently published in Nature Immunology, by the same authors examines antibody-producing cells in patients with lupus erythematosus; the auto-antibody producing cells mostly come from cells outside subset D.
The research was supported by the National Institute of Allergy and Infectious Diseases (P01AI078907, R21AI109601, R37AI049660 and K23AI67501, R21AI094218, U01AI045969, U19AI056390, N01AI050029) and the Atlanta Clinical and Translational Science Institute/National Center for Advancing Translational Sciiences (UL1TR000454).